"Protecting the Beauty of our Landscape"
The North Devon Areas of Outstanding Natural Beauty (AONB) is a stunning coastal area which is nationally protected for the beauty of its landscape. It is made up of several distinct landscape types, each with their own special habitats and geology, including the most vulnerable and beautiful parts of the UNESCO World Biosphere Reserve centred on Braunton Burrows. The North Devon AONB covers 171 km sq. of coastal landscape from Marsland Mouth on the Cornish border, to Combe Martin on the boundary of Exmoor National Park. The designation as an Area of Outstanding Natural Beauty in 1959, places it in a family of 41 AONB's and 11 National Parks which together make up the finest landscapes of England and Wales. Landscape. The North Devon AONB contains a surprising diversity of scenery including tall rugged cliffs, wave cut platforms, wide sandy bays, sand dunes, traditional hedged fields with wind sculptured trees, steep sided wooded combes and woodland that runs right to the cliff edge. Encompassed within the designated area is the dramatic coastline of the Hartland Peninsula, the calm tranquillity of Bideford Bay, the internationally important conservation sites that flank the Taw and Torridge Estuary, the striking headlands and golden beaches of the North Devon Downs and the secluded coves and bays of the North Devon High Coast. Wildlife and History. The landscapes of the North Devon AONB encompass a fantastic habitat resource for wildlife. 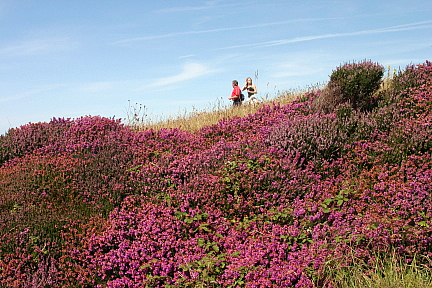 These include the culm grasslands around Hartland, the coastal woodlands near Clovelly, the heathlands around Hartland and Morte Point and the extensive sand dune systems at Braunton and Northam Burrows. From the floral orchids of the sand dunes, the bluebells of the coastal combes, to the birds and insects of the coastal heaths these varied habitats support a rich variety wildlife. The AONB also contains a wealth of historic and archaeological sites with buildings and old field patterns that reflect the progress of man from pre-historic times to the present day. Community and Economy. Approximately 12,000 live within the AONB, the largest settlements being Combe Martin and Hartland. Other well known villages include the picturesque villages of Clovelly, Berrynarbor and Croyde. The larger settlements of Ilfracombe, Bideford and Braunton lie on the very edge of the designated area and provide excellent 'gateway' towns into the AONB. The economy of the AONB is dominated by agriculture and tourism which has had a major influence on the landscape of the area. Recreation. Many people come to the North Devon AONB to enjoy the beaches and dynamic coastline, while others wish to discover the peace and tranquillity of the countryside. 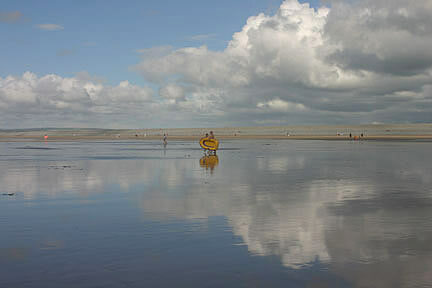 The expansive beaches of Westward Ho!, Saunton, Woolacombe and Croyde provide many visitors with the opportunity for watersports and places for relaxation. The South West Coast Path passes along the entire coast of the North Devon AONB on its 630 mile journey around the South West of England and the many public rights of way provide ample opportunity to discover all areas of this fascinating and spectacular countryside. Management of the North Devon AONB. The North Devon AONB is not a museum, but a living working environment, a home to a vibrant local community, which makes a major contribution to their livelihood and quality of life, through farming, tourism and recreation. Careful and sympathetic management is essential to ensure that it remains that way. The North Devon AONB team was set up in 2004; its role is to assist others in the conservation and enhancement of this valuable and nationally important asset. *The Countryside Agency, Devon County Council, Torridge District Council and North Devon District Council provide funding for management. *Those who live, work and visit the area are crucial to the future well being of the AONB.